MANSFIELD, Mass. – Mansfield took the lead just under 10 minutes into the contest but Foxboro was able to level the score early in the second half as the teams each opened their seasons with a 1-1 draw. The Hornets came out of the gates with a lot of pressure, resulting in a pair of corners and a handful of throw-ins in the attacking third. Because of senior Max Gurnon and junior Sam Hyland, those chances turn into set piece opportunities with long throw-ins that find the area. The Hornets were able to cash in numerous times a season ago using long throws and it worked again in the first 10 minutes of this season. Gurnon launched a throw into into the center of the area, just near the edge of the six yard box. The ball was touched down but the Warriors were unable to clear it. Hyland pounced on it and buried it into the back of the net in the 10th minute. Neither team was able to produce a serious scoring chance for the final half hour of the first half. Both teams tried to use set pieces, mainly corners and long throw ins, to get the offense in gear but neither could register a threatening chance. 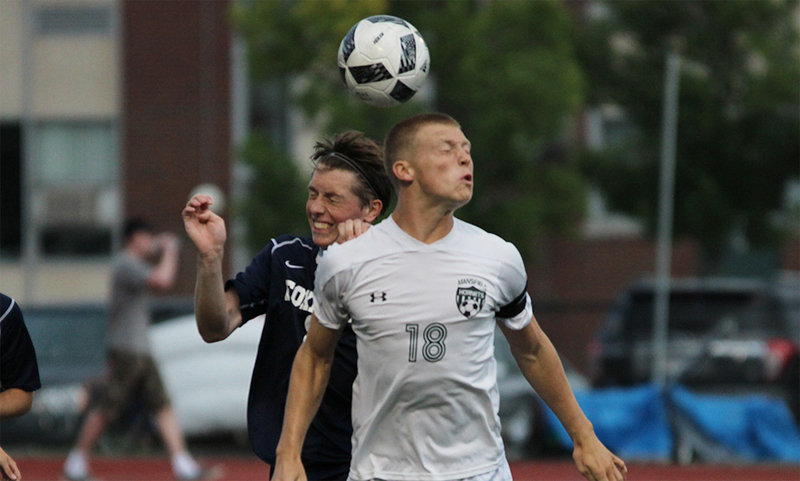 Foxboro came out on the front foot in the second half, controlling more of the possession with senior Anthony Barreira dropped from his striker role to the center of the midfield. Similar to what Mansfield did in the first half, Foxboro worked the ball forward, earning attacking throws. Senior Jeff Melo was the go-to guy on the throws for Foxboro. In roughly the same area as Gurnon’s throw in the first half, Melo tossed the ball to the back post, eluding a pair of airborne Mansfield defenders and find the head of sophomore Matt Garcia. Garcia directed it on frame and into the back of the net for his first career goal. “We got a little tired,” Mansfield head coach Steve Sheridan said of the change in the second half. Foxboro kept the pressure up following Garcia’s goal. Just over the halfway mark of the second half, the Warriors earned a corner kick. Barreira’s first attempt was low and cleared back out. Melo dished it back to Barreira, who quickly curled in a cross to the near post and Garcia got his head to it again, but it went just over the bar. Both teams relied on set pieces for the majority of the second half as both defenses stood tall in the run of play. The Hornets had one final chance in the final minute as the ball popped out to junior Jackson Murphy. Murphy played it back into the area towards the far post but Foxboro goalie Aaron Wentling got a hand to it and pushed it wide. Mansfield boys soccer (0-0-1) is back in action on Saturday when it hosts New Bedford at 7:00 at Alumni Field. Foxboro (0-0-1) is back in action next week when it hosts King Philip on Tuesday at 4:00. FOXBORO, Mass. – Less than 48 hours after being no hit in a 2-0 extra innings loss to Attleboro, North Attleboro did a complete 180, and jumping out to a quick start in a 4-0 victory over Foxboro. Leadoff man Kyle McCarthy slapped a stand up double to start the game for the Rocketeers, and senior Brian Poillucci’s ground out pushed McCarthy to third. Zach DeMattio drove McCarthy in from third on an RBI single, and an infield single from Ridge Olsen put runners on first and second. Tyler LaFreniere ripped an RBI double to make it 2-0, and also put himself and Olsen into scoring position. Two consecutive batters were hit by pitches, the first one loading the bases and the second one bringing a run home, making it 3-0 North Attleboro. 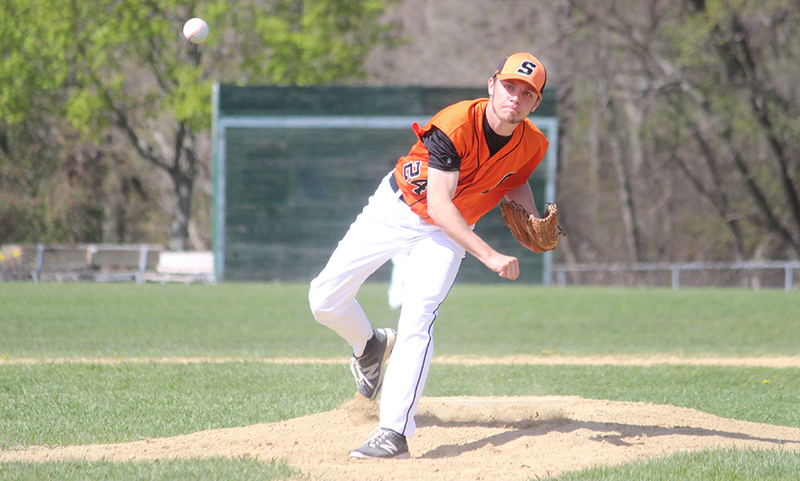 With the bases still juiced, Foxboro starting pitcher Aaron Wentling battled back and ended the inning on a strikeout looking and a fielder’s choice ground out. The game marked the last starting pitching appearance for North Attleboro senior John O’Donnell and he made the most of it. The crafty lefty threw a complete game shutout, tallied seven strikeouts and only allowed two hits while on the hill. He allowed one runner via a hit by pitch in the second, walked one batter in the bottom of the seventh and let up two singles, one in the fourth and one in the seventh. The Foxboro bats couldn’t respond to the initial North Attleboro crooked run inning, and O’Donnell wasn’t making it an easier for them. The senior lefty jumped ahead in virtually every count, and didn’t waste any time wasting pitches even when he was up 0-2 in the count. His inside and outside pattern of his fastballs were complemented by his off speed plunging lefty curve. However, when the ball was put into play, O’Donnell’s fielding core was there to track down numerous fly balls and quick grounders looking to get through the gaps. After the first inning, Wentling settled in and didn’t allow a run for the remainder of his outing. He fanned five and his defense made many plays, including three double plays. No runs were scored again until the top of the seventh. Wentling was replaced by senior Steve Couroupacis. An infield single followed by a sacrifice bunt moved the runner to second. Back to back walks loaded the bases for the Rocketeers. An RBI single from LaFreniere, his second RBI of the night, was the final insurance run for North. A double play ended the inning and left only three outs for the Warriors to work with. A leadoff walk in the bottom half for Foxboro followed by a single from Cam Feldman threatened North, but the door was closed shortly thereafter with a 4-6-3 double play and a game ending ground out to second. North Attleboro snapped a nine game skid with the win, improving to 7-12 overall and 6-10 in league play. The Rocketeers will conclude their season on Friday when they host Bishop Feehan under the lights at Community Field. Foxboro (7-12, 5-11) next hosts Carver as they prepare of the MIAA tournament.